Dear Friends, My therapist is on the third floor of a building with four floors and an elevator. Since I started seeing her about a year ago, I have always taken the stairs to her office. A few weeks ago, I was diagnosed with a metatarsal injury that requires me to minimize time on my feet and wear a walking boot for several weeks. It's a heavy contraption, so walking up three flights of stairs while wearing it is challenging, not to mention a violation of the minimal walking edict. But getting into an elevator to go up three flights of stairs is actually more difficult for me. I'm glad that I go directly to my therapist after taking the elevator because I can share with her my distress about not taking the stairs. We can discuss the shame I feel at be in less-than-perfect shape and not at the top of my game. It's easy to assume that my elevator shame is a remnant of generations of hardworking Midwestern Protestants on my mom's side of the family. And I'm sure they had a lot to do with it. But, after informally polling my friends, I think that our culture is also implicated in a couple of ways. The effort involved in being a "superpower" nation may be trickling down on all of us, creating a constant drive to be on top in every possible situation. Additionally, the belief that each of us individually is in full control of our destiny causes us to feel shame whenever we aren't able to be in control. Like when we are injured or simply aging. Are we climbing up or falling down? Last week, I had lunch with a friend from a nearby country who is living in the US temporarily. Over hummus and pumpkin kibbeh, we were bemoaning the need for the advance planning required to spend time with friends. She commented that our culture's extreme busyness might have less to do with work and more to do with self-importance. Everything is in service of being or becoming the very best at whatever it is we do -- whether that's a paid job or something like parenting or watercolor painting. This leaves little time for play. We have been trained to give our all to everything we do, as if life were a race to the top. But life may be more of an easy ride down, as James Taylor puts it in Secret O'Life: "Nobody knows how we got to the top of the hill. But since we're on our way down, we might as well enjoy the ride." It feels like blasphemy to ask the question, "What's wrong with sometimes being number two?" especially since the vast majority of us are that. As General George S. Patton told the Army in 1944, "The very thought of losing is hateful to Americans." With apologies to General Patton, I personally don't see the downside of letting someone else lead the way for a time while I put my feet up. The culture of individualism says that each of us must strive to be the top of the top, the cream of the crop and that it's possible to control how we rank. But it's impossible for all of us to be number one and it's impossible to control every aspect of life. If we start by acknowledging these simple truths, we may be able to cut back on a lot of our self-imposed stress. We can start by designating one or two days a week to letting ourselves off the hook. On those days, let someone else be the best grant writer, dancer, cross-fitter, dog owner, parent, etc. Accept that you aren't number one today, and find the sympathetic joy in letting someone else be the best. Perhaps our survival doesn't depend on who is the fittest, but who is most content. Zen Master Thich Nhat Hanh has suggested we reverse the old saying "Don't just sit there, do something" to "Don't just do something, sit there." Create more "unproductive" moments in your day -- like hanging out on the stoop, watching a movie, or lingering over a glass of wine with friends -- guilty pleasures that usually fall to the bottom of our To Do lists. If we are always clawing our way uphill we exhaust ourselves to the point where we can no longer enjoy the precious moments of our lives. 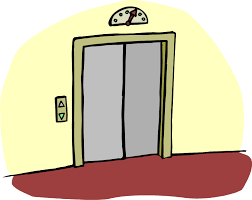 Each time I walk into my therapist's building and see the elevator, it reminds me that I am not currently the number one most fit and healthy woman in the world. When I tell myself I must be, I create shame and anxiety for myself (and others), which disconnects me from the world as it really is and leaves less mental space for a chat with one of my daughters or a relaxed dinner with my partner. At 54, I am beginning to learn how to step out of the race, step into the elevator, and just enjoy the ride. I hope you'll join me.